Shri Manik Prabhu is considered as the fourth avatar of Shri Dattatreya. It has been mentioned earlier that devotees of Datta-Tradition are both orthodox and liberal and include many Muslims. Perhaps the largest number of Muslims may be found among the devotees of Shri Manik Prabhu, an obvious reason being the location of his activities was in the Muslim state of Hyderabad ruled then by Nizam. The Muslim rulers gave full support to Manik Prabhu and his religious activities. Another peculiarity of this avatar is that while all other avatars of Shri Dattatreya as well as the saints of Datta-Tradition are known for austerity, Shri Manik Prabhu was a Rajayogi (Royal yogi) and his set-up is known for its royal splendour and luxury. However Shri Manik Prabhu himself was never attached to them. He gave away all in charity but always the splendour continued. There is a town called Kalyan in the erstwhile Hyderabad state under Nizam. (It now falls in Karnataka state after the states were reorganised). It was actually the capital of a mini-state under a Nawab (Muslim ruler). There used to live in this town a pious couple named Manoharpant Naik and Baiamma. Their family worshipped Khandoba (a form of Shiva) but there was also the tradition of japa (continued repetition) of the name of Shri Rama in his family since the days of Manoharpant’s grandfather. Manoharpant’s mother was a devotee of Hanuman. Manoharpant himself was an ardent devotee of Shri Dattatreya. The family was thus very religious minded. They had three sons, Hanmant (or Dadasaheb), Manik and Narasimha (or Tatyasaheb). 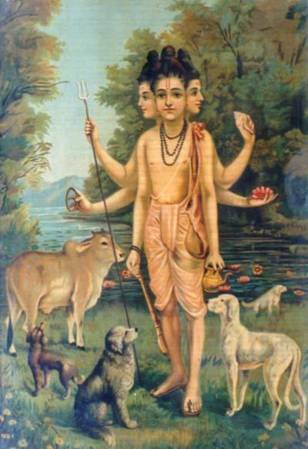 Before Manik was born, Manoharpant was told in a dream that the child would be an avatar of Shri Dattatreya. Manik was born in the house of Manoharpant’s grandparents in the village of Ladwanti on December 22, 1817. Though he was named Manik (meaning ruby) he was fondly called by his parents as Ratnya (meaning jewel). Manik had such a bright aura that people in the village used to come just to see him. Manik was playful as a boy. He used to spend all his time playing with the children in the neighbourhood or going with them to the nearby woods for cattle grazing. But he never went to school. All the efforts of his elders in that direction were in vain. Because of this his people thought him to be mad and began referring to him as “Veda Bhau” meaning mad brother. Though he never went to school he could speak, read and write several languages like Telugu, Kannada, Marathi, Persian, Urdu and Sanskrit. He also had the inborn knowledge of the Vedas and Shastras. Perhaps his father taught him to write at home but he could not have taught him all these languages. It is said that when the thread ceremony was performed at the age of seven for his formal entry into Brahminhood he started reciting the daily ritualistic mantras as soon as the Gayatri Mantra was whispered in his ear. Sometimes Manik would apply ash on his body and speak on spiritual topics like an elderly person but his playing all sorts of games with children did not stop. His games included mock worship using stones for idols. He used to teach his companions lessons in spiritual life through the games. He especially did not like that animals be tortured or killed, not even scorpions. Occasionally he would remain in the woods for couple of days without trace. Even when he was a child, he seems to have occult powers. Once the children found a dead parrot while playing. Manik took the body in his hands and fondling it threw it in the air asking the bird to fly away to its nest and it really did fly away. People discovered that what he spoke came out to be true. Because of some supernatural events people from neighbouring villages developed a faith in him and began paying him visits and give gifts and money. They began calling him Manik Prabhu (Prabhu meaning master) and later referred to him only as Prabhu. He had a cowherd friend named Govinda. For three or four days Govinda had not joined the group for playing. Manik went to his home to call him. He found Govinda’s mother crying because Govinda was dead and they were preparing to take his body away for cremation. But Manik asked the mother not to cry and told her that Govinda was not dead but merely sleeping. He also added that if she told him aloud that Bhau has come to meet him he would wake up. She did that and Govinda really got up and went away with Manik. This news spread around like wild fire and Manik had to go in hiding for a few days to avoid the rush of people. In the course of time Manoharpant died. A family friend named Bhalchandra Dikshit, a learned and highly respected Brahmin from a neighbouring village of Hallikheda came to Kalyan to offer condolences. When he saw Manik he realised that the boy was something special. He inquired about him to Baiamma. She complained that Manik was not interested in studies and instead went around playing the whole day and behaved eccentrically. She requested him to take Manik under his care and give him some education. Mr. Dikshit who was already attracted to the boy agreed. Manik went with him without protest. At Hallikhed also his behaviour did not change, but Mr. Dikshit left instructions to let him do what he liked. Manik was very pleased with the faith Mr. Dikshit kept in him and one day told him so. Later Narayan Dikshit, his son became one of the principal disciples of Shri Manik Prabhu. The two families became connected through matrimony: Hanmant, Manik’s elder brother, married Mr. Dikshit’s daughter. After some days Manik returned to Kalyan. In Kalyan everybody in the family was unhappy about Manik because his activities did not bring any income. His maternal uncle arranged a job for him at the octroi post (post where tax on incoming goods is collected). His job was to collect octroi and maintain accounts. The job went on well for some time but afterwards Manik began giving away the collections to the poor. Finally he gave up the job. One day, when he was about sixteen years of age, his uncle scolded him for leading an idle life and asked him to leave the house. Manik left home without telling anybody and went to a village called Manthal fifty miles away. There is a holy lake called Ambilkund near the village and caves in the nearby hills where he spent his time in meditation. Occasionally he would be seen wandering in the woods. When the relatives tracked him down and met him there he told them that as promised he has taken birth unto them and remained with them until the thread ceremony. Now he has to travel and finish his duties as an avatar by gracing the devotees. They should not feel sorry for his departure. But since they were insisting he would soon come and visit them. He also advised that they should continue their service to Shri Dattatreya and assigned Tatyasaheb for carrying out the family duties. During this period villagers who now knew him to be a great yogi came to meet him in large numbers. The custom of “Butti Jatri” which in Kannada implies collective meals shared from whatever the visitors had brought started from this time onwards. Shri Manik Prabhu remained at Manthal for six months. Occasionally he went to the cave in the Manthal forest. That cave is now known as Manik Prabhu Cave. After about a year Manik Prabhu returned to Kalyan and remained at home for about five years. When people came to know he had returned, they rushed to meet him and take his blessings. They brought lots of gifts which were always distributed among the poor. Programs of bhajans, kirtans etc. were regularly held and thus people’s mind was constantly directed towards God. Manik Prabhu left home for some time to visit the holy places nearby, including the temple of his family deity Khandoba where the occasion of Dattajayanti (birth of Shri Dattatreya) used to be celebrated in a big way. After returning he arranged for his younger brother Tatyasaheb’s marriage. The marriage was celebrated with great pomp in which the Nawab of Kalyan also spent ten thousand rupees, (a great sum in those days) in charity and for feeding Brahmins and poor people of all communities from all around. Now the crowd of visitors to Manik Prabhu was on the increase. Off and on Manik Prabhu would tour the surrounding regions and help people by using his occult powers. Once he went to the state of Mudhol and spent time in meditation in one of the caves in the local hills. While he was travelling in this region he revived a person who had died of snake bite. That spread his fame so much many centres for service to him were established in the region. From this time onwards Shri Manik Prabhu decided to make this place his permanent abode. When the government officials (not the secular government of today but the Muslim government one and half centuries ago in the Nizam era) came to know about this they came to meet Shri Manik Prabhu, had the Shiva temple cleaned and renovated, and performed Rudrabhishek ceremony in the service of Shiva. People were fed; Brahmins were given dakshina of one rupee each. Money was also given in charity to the poor. The place was now flooded with people coming to see Shri Manik Prabhu. He used to sit under a bel tree while the devotees took shelter under the surrounding trees or in makeshift tents. The government officials left a commissary with stock of grains and other provisions. They also provided many servants for the local arrangements. All visitors who came for relief, including the sick, were fed through this arrangement. His mother came to live with him along with the younger brother but he ordered them to return to his elder brother Dadasaheb permitting them only weekly visits either on a Thursday or on a Saturday. Later, at the time of Dattajayanti celebrations, a gadi (seat of ruling) of Shri Dattatreya was established at the place. Routines of daily worship, arati etc. were also established. The place slowly turned into a village and then a town and was named Maniknagar. Later the devotees established a gadi for Shri Manik Prabhu also and he began occupying it for the benefit of his devotees. The meetings held here were like a royal durbar (court) and was called Maniknagar Durbar. The fame of Shri Manik Prabhu spread among the Muslims also. They too flocked there for offering their respects and receiving his grace. People from both Hindu and Muslim religions, afflicted with incurable diseases, people possessed by spirits, people looking for success in life and those desirous of children all flocked there and their desires were fulfilled. They offered lots of money, jewellery, clothes etc. at Shri Manik Prabhu’s feet. As a result the custom of celebrating two Muslim festivals including Muharram and two Hindu festivals including Dattajayanti started. These were celebrated on a grand scale. During these festivals Shri Manik Prabhu used to distribute money to the needy. Generally nobody left without receiving something from him. In the course of time government developed the town and established gates and markets and provided security in Maniknagar. Shri Shankaracharya of Shringeri once visited him and was welcomed and treated with honour. Another time Shri Swami Samarth came to visit him and had a private meeting (See Part V-A). Shri Manik Prabhu then decided to take samadhi but kept this a secret except from three or four reliable confidants instructing them that the news that he had taken samadhi should be revealed only after four days. This was necessary because the devotees, especially the Muslim devotees, would have created obstacles. 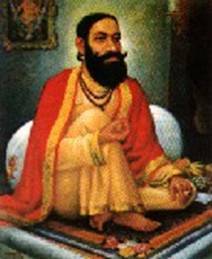 He instructed that people should be permitted to visit the samadhi only four days later and Manohar (Appasaheb), the son of his younger brother Tatyasaheb be appointed to his gadi (seat) as successor on the sixteenth day. His elder brother and mother had already died and had received proper spiritual advice from him before they passed away. Accordingly, in the year 1865, on the Ekadashi day of bright fortnight of Margashirsha month by Hindu calendar (Shaka year 1787) he took bath early in the morning, had himself worshipped by Appasaheb and wearing flower garlands made Appasaheb perform his Pancharati and gave prasad to those present. Putting the garland from his own neck to that of Appasaheb and blessing everybody, he sat in the previously constructed enclosure for samadhi. This was a critical moment for all present. They shouted in unison, “Avadhut Chintan Shri Gurudeo Datta” and with tearful eyes put bricks and mortar to close the entrance of the enclosure. One can only imagine the kind of mood these people had in those moments when their Guru and saviour would be seen no more in his material body. As instructed, on the sixteenth day Appasaheb was appointed to the gadi. Manik Prabhu had many disciples from all communities. One prime disciple was a woman named Venkamma. She was a child widow and used to visit Manik Prabhu daily when he was at a village called Mylar. When asked she told him that she had nowhere to go and she was not going to leave his feet. He told him that he was a wanderer without any possessions and if she wanted to be with him she would have to give up all the ornaments and wear ashes. She immediately removed all ornaments and offered them at his feet. Seeing her devotion he arranged that she will be under the protection of his mother. After testing her rigorously he permitted her to be among his disciples. He never spoke to women. Women were not allowed in the Durbar unless they were accompanied by their husbands and when this was not possible they had to speak through Venkamma. When Venkamma died her Komtee community people came to claim her body but when they lifted it sounds of Aum started coming from the mouth. Finally on the instructions of Manik Prabhu, the final rites were performed by Brahmins. Among other disciples were Narayan Dikshit, a famous singer named Tarra Husen Khan, Bappacharya and Vithalrao Kulkarni. As said earlier Shri Manik Prabhu was a linguist. He was also a good orator and had a beautiful voice. His poems are well-known in the old Hyderabad region both to Hindus and Muslims. He has written a book called Kalpataru. His day of samadhi is celebrated every year and is coupled with the Dattajayanti celebrations four days later. His sect is called Sakalmat Sampradaya (loosely translated as the sect of universal thinking). The basic tenets of this sect are that if we ignore the differences due to time and geographical location, the basic principle of all religions is the same and all have considered attaining God and liberation to be the main aim. The differences do not affect equality and brotherhood. The sect was further expanded by Manohar Manik Prabhu. Subsequent successors were Martanda Manik Prabhu, Shri Shankar Manik Prabhu and the current Shri Sidharaj Manik Prabhu. We see in Manik Prabhu a saint who was very dispassionate and detached in spite of the royal splendour he was exposed to. Everything he did was for people’s benefit. Like Shripad Shrivallabha, Manik Prabhu did not have any Guru nor did he take sanyasa. Whatever happened in his life happened as if ordained by the divine. It is really amazing that a Hindu saint was so much honoured and worshipped by Muslims and that too in a Muslim ruled state. One other example of such tolerance is that of Janardanswami (see later parts), who served the Muslim king in Daulatabad (former Devgiri). The king even made Thursday an official holiday instead of Friday as it is customary in Muslim states. Dhere (see Bibliography) remarks that, though Muslims flocked to Hindu saints like Manik Prabhu, it was not because of the religion but because of their occult powers and miracles performed by the saints. Though the Sakalmat sect was founded by Manik Prabhu, it was not a religion and it is doubtful if any Muslims joined it. Offered at the feet of my Guru Shri Shankar Maharaj. Santakripa (Various issues) Monthly magazine published by Santakripa Pratishthan Pune; also various biographies published by them.